Bloom where you are planted. Light up the rocky ground with the fire of the gifts and enthusiasm that God has given you. If lovely flowers can bloom vividly on the slate roof of a building, we can light up the rocks where we’re planted with God’s glory. I’m a Texan. I love Bandera, Texas, “Cowboy Capital of the World.” It’s my home and the setting for most of the Christian mystery-romance-suspense books that I’ve written: Bridge to Nowhere, Love’s Beating Heart, Shadow Chase and Until the Shadows Flee. Heart Shadows is set in the Nevada desert. When my job ended in Bandera, I left. I’ve left Bandera before, but I’ve always gone back. I call it the boomerang effect. The LORD told me to leave, but I fought against going. I prayed and begged God to change His mind all the way to Alabama. Alabama had an even higher unemployment rate than Texas – which made me wonder why I was there. It took me a couple of months to find a job. I had never been out of work before in my life. But it gave me time to write my next Sunpenny Publishing release, Bridge Beyond Betrayal, and when I did find a job, it was a great job with a great boss. God blessed me for blooming where I was planted – even though it wasn’t Texas. Now that I’m in Scotland, I realize why I was in Alabama. The LORD moved me there to shake the soil out of my roots and free me to marry my wonderful husband, author Alan T McKean (The Scent of Time & The Scent of Home). Surviving in a colder, wetter climate and adjusting to culture changes sometimes made me feel like a weed clinging to a rock, more likely to fall off than bloom. But with God’s grace, my life has blossomed around me in spite of all my human errors and weakness. Besides having a great husband, a lovely rough collie dog named Angel Joy, and living by the sea in a place that simply has no ugly views in any direction, the LORD has given me time to write. That resulted in the pro-life adventure-romance, Love’s Beating Heart, which has been acclaimed by critics as “inspirational” and “life-changing.” God blesses us when we bloom where we’re planted. So if you find yourself planted in rocky ground, decide to fire the rocks with your beauty. You are beautiful because God created you and He doesn’t make junk! God gives all of us gifts. You may not be a writer, but God has a plan and a purpose for your life. He has a reason for sticking you in the rocks. 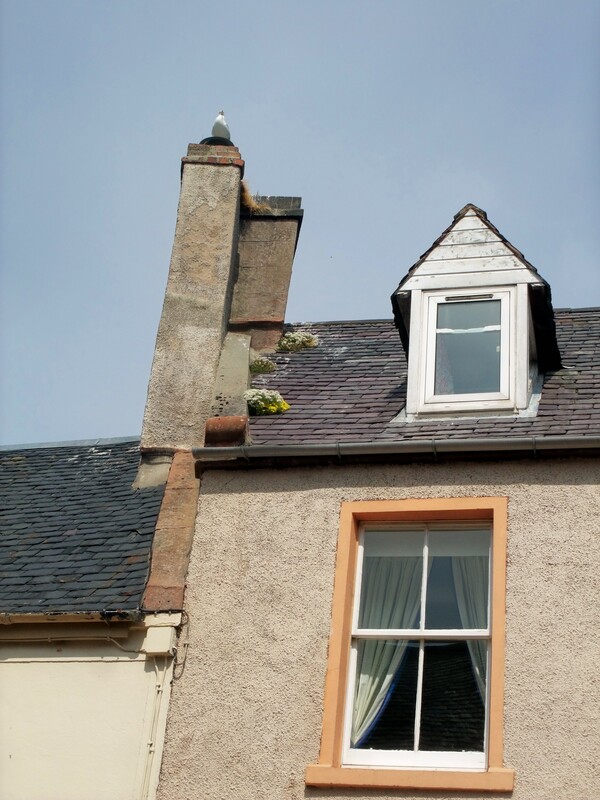 Think of the lovely roof flowers waving cheerfully from their lofty heights on slate and be encouraged. All things really do work together for good to them that love the LORD, just like the Bible promises. If God sticks you in the rocks, He will water you with a special blessing that you wouldn’t get anywhere else. Fire the rocks with beauty! Posted on July 31, 2013 by authorstephanieparkermckean •	This entry was posted in Uncategorized and tagged Alabama, Bandera Texas, bloom, books, boomerang effect, Christian, Cowboy Capital of the World, god, mystery-romance-suspense, Nevada desert, pro-life, Sunpenny Publishing, Texan, Texas Hill Country. Bookmark the permalink.